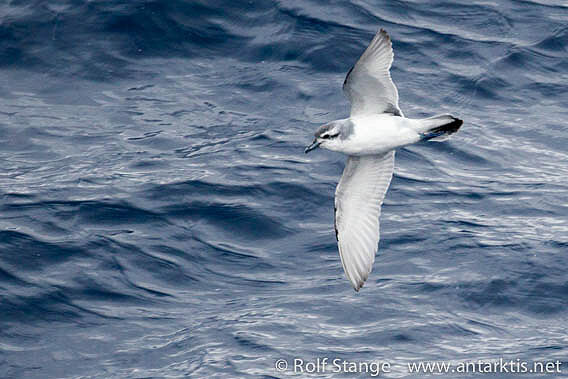 Photo galleries and triplog of the Ross Sea voyage with MV Ortelius in January-Februar 2015 are already online. Now, the first of several panorama series that have been taken during this trip is published. At Cape Evans, I had the rare opportunity to take panorama photos inside Scott’s hut from his last expedition with Terra Nova (1910-1913) and of the surrounding landscape. The results can now be seen on this website (click here). 10 panoramas, 8 from inside the Terra Nova hut and 2 landscape panoramas of Cape Evans, can be viewed both individually and as a virtual tour, taking the visitor online through all corners of the hut and around at Cape Evans, where you can see Mount Erebus, McMurdo Sound frozen between Cape Evans and Hut Point further south, with islands including Razorback Island and Inaccessible Island that are known to those who have read Scott’s diaries that were published as Scott’s last expedition. Short commentary comes along with the individual panoramas. 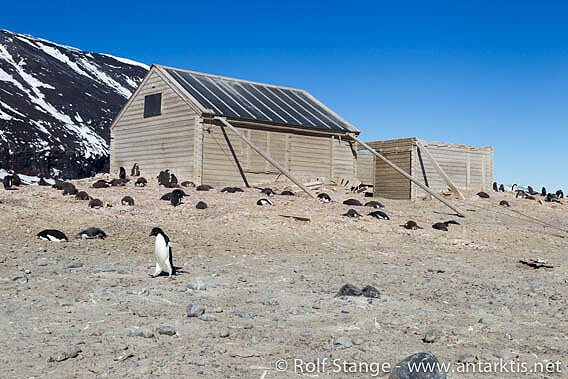 Most of them are inside the hut, showing all parts of the famous base from which Scott went to the South Pole. It is well known that he and his 4 comrades died on the way back. 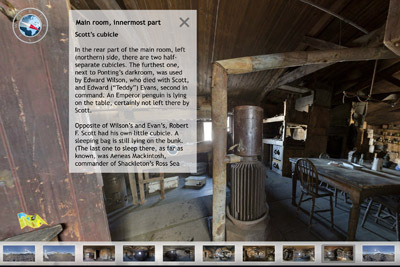 Screenshot of the virtual tour through Scott’s hut at Cape Evans. 09th-10th February 2015 – The journey came to an end a week ago, but we have to have a final blog entry. We can’t just leave good Ortelius somewhere near Campbell Island. 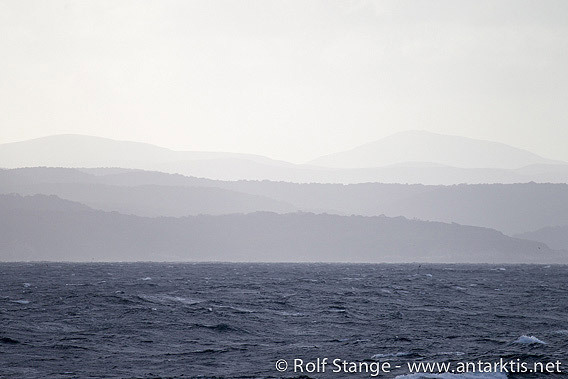 On 09th February, the gently rolling hills of Stewart Island came into view, on the horizon first, then slowly coming closer, to everybodies delight. 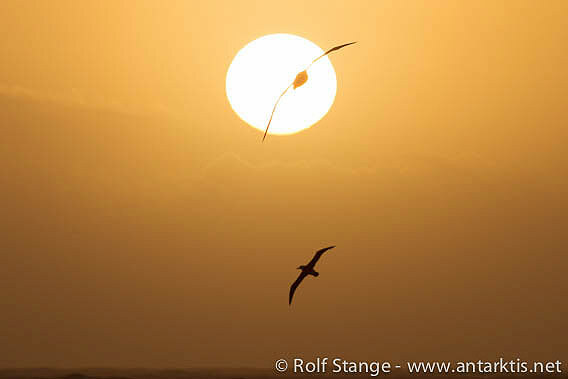 That was obviously a signal for the Albatrosses to say goodbye to us during that day. 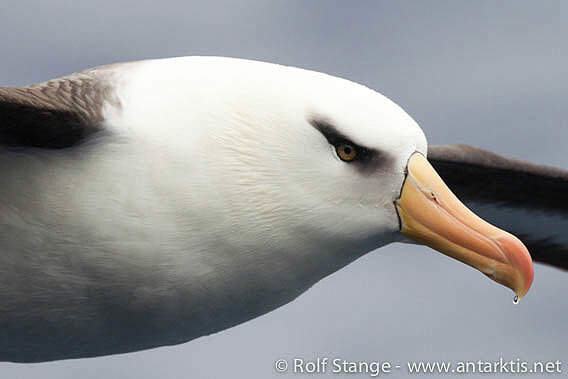 By the way, White-capped albatrosses had been amongst our faithful attendants for sometime. Admittedly, I had initially believed they were juvenile Campbell albatrosses. But now, they are fully grown, beautiful representatives of a species that I had never seen before, or more likely, that I had not knowingly seen before. Splendid! The end of a big journey is usually rather profane. Passports need to be stamped (took surprisingly long), luggage to be moved from ship to shore (went rather quickly), hands are shaken (not enough time) and then a seemingly endless number of food items is carried down into the ship (took far too much time). Then, relaxed moments in a café, claiming to be the most southern outpost of its globally known owner company, in Invercargill (a one-horse town … sorry, did not want to offend anyone) and in a pub in Bluff (compared to which, Invercargill is a metropolis) with my good fellow colleagues. A day later, the beginning of a long series of 6 flights half way around the planet. 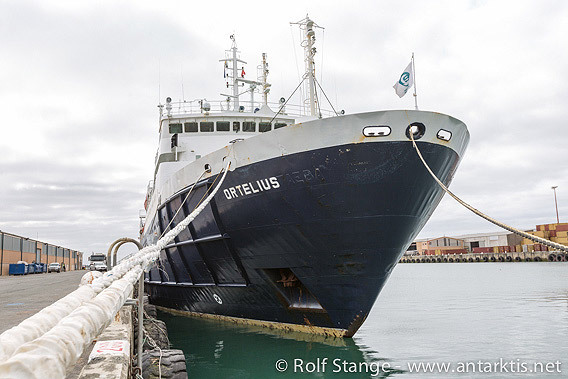 Meanwhile, Ortelius is on her way again, now already well on her way back into the Ross Sea. On the way south, Campbell Island was far more friendly than a few days before, when we were there on our way north, as far as I have heard. Well, good luck to the ship and all on board, have a safe, great journey into the Ross Sea and beyond! That’s it with my antarctic blog for the moment. Not too long before I will continue in the arctic. 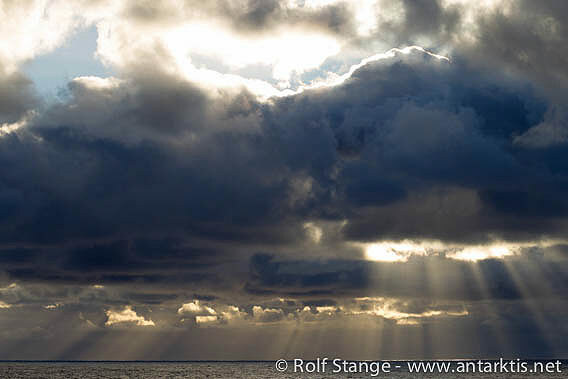 But before we get that far, have a look at the triplog and the comprehensive photo galleries from this Ross Sea voyage, the antarctic odyssey, semi-circumnavigation. Advanced Antarctica. And during the weeks to come, I will obviously update the antarctic panorama collection on this website. I started the polar panorama photo pilgrimage 2 years ago in the Ross Sea. Looking back, I think I have used these 2 years for good benefit. 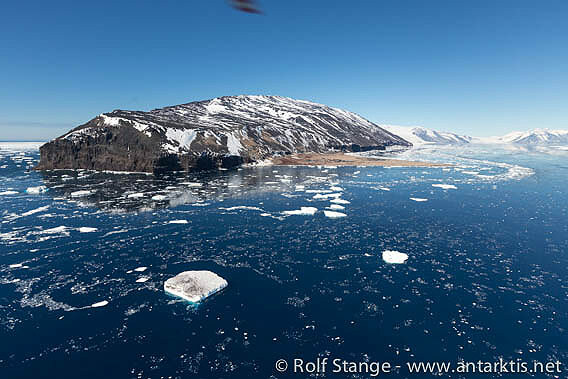 It will be well worthwhile to have a look at the Ross Sea panoramas photos soon. So have a look. After the trip is before the trip. In case the headline reminds you of the previous blog entry, there is a reason for that. It is just how the area is. Our early morning attempts to land on Campbell Island were doomed by winds of 40-50 knots, it was not even possible to keep the ship longer in Perseverance Harbour than just a few moments, let alone drop anchor or even zodiacs. 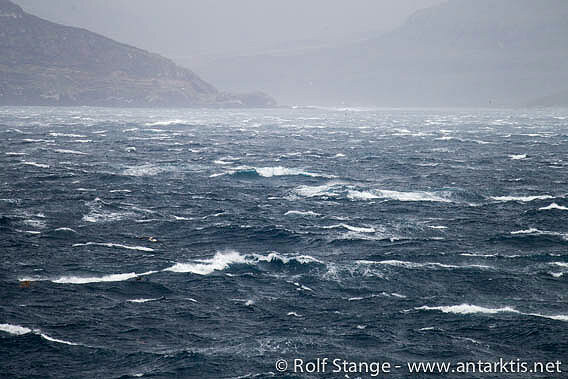 The bay provides shelter from the westerly swell, but channels the wind, making it even stronger than it is outside. Considering near windy 30 hours spent off Campbell Island, time running out and a forecast not giving much reason to be optimistic, there is not much choice but taking off, back to the high seas, and setting course for Bluff, our next and last stop, in New Zealand. Campbell Island was not meant to be, or, as a fellow traveller put it so nicely: it is the privilege of an island to say ‘no’. The following day at sea was a bit of a roller-coaster ride. Rocks on the road. But those who live here don’t use cars or bicycles, and they don’t walk. Nature has equipped them with the most elegant and efficient wings and they glide without effort sharply over waves that keep some of us from enjoying their breakfast. More than a dozen Royal albatrosses keep circling around the ship, approaching every couple of minutes to the delight of those who stay outside as if they were glued to the deck. Regularly, eyes and cameras go up, when the large royals of the winds and their smaller relatives (subjects?) come near, as little lunar objects around our little planet, the ship Ortelius, seemingly following Kepler’s laws. For a few precious moments, we even have the pleasure to enjoy this with the golden sun disappearing behind some low clouds in the evening. The Southern Ocean – that sounds like some warm, quiet islands with beaches and palm trees. But that is the roaring forties, the furious fifties and the screaming sixties. They keep living up to their bad reputation today. That is quite a spectacle in itself, and of course there was no serious thought about any zodiac cruising along Campbell Island’s wild cliff coasts, searching for Yellow eyed and Eastern Rockhopper penguins, various Albatrosses, Sea lions and so on, not to mention going ashore. Well, if we can’t get to them, maybe they will come to us. And they do! 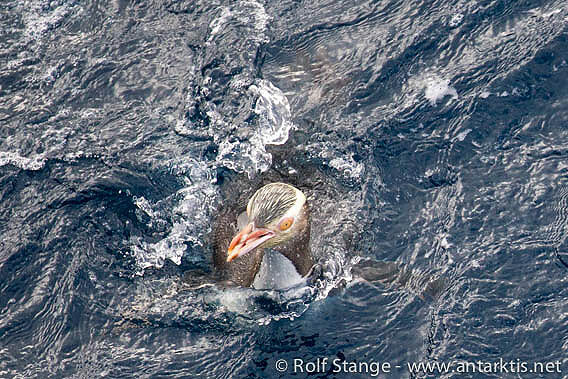 Dozens of Albatrosses around the ship, and some patience is rewarded by sightings of Yellow-eyed penguins plunging in the water near the ship. Brief sightings, but … sightings! The odd Sea lion jumping out of the waves. Have I ever seen this many Great Albatrosses in one place? I am quite sure I haven’t. Southern Royals, all of them, as far as I can tell. 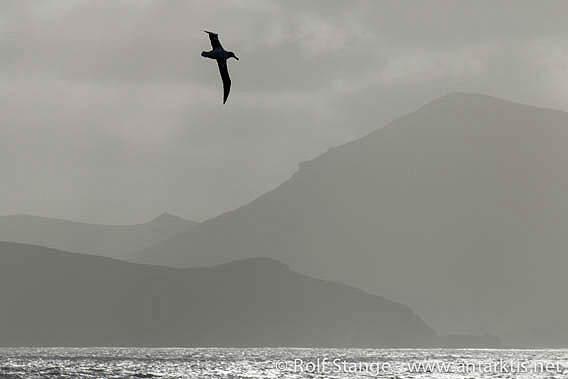 And all the smaller o nes, Campbell albatross, plenty of Light-mantled sooties … the whole lot. The windmeter is almost equally interesting. A steady 40-50 knots for a start, and then the gusts. The strongest one I have seen was 84 knots, that is a good 150 km/h. Wind force 12 on the Beaufort scale starts at 64 knots. Force 12 is the last once, called hurricane. 84 knots. Fingers crossed for tomorrow morning. If it is getting a bit (a good bit, that is) calmer, then we’ll go ashore on Campbell Island shortly after sunrise. That would, of course, be the icing on the cake. 04th-5th February 2015 – It was clear that the nice weather was not going to last forever. We still can’t complain. We have got southerly to southwesterly winds, so it does not slow us down too much. Time is key. But now we do feel that we are actually on a ship. Some are enthusiastic for the wild ocean and the big waves, others less so. If you put on some warm clothes and spend some time outside – the aft deck on level 4 is decidedly the best place to watch and photograph birds, that is where the community meets – you will get a lot. We are back to the Albatros latitudes, the furious fifties, which are now living up to their good reputation. 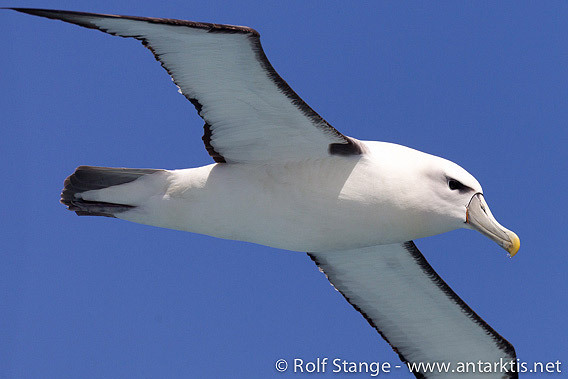 Buller’s albatros, Wandering albatros, Southern royal albatros, Campbell albatros, Light-mantled sooty albatros, did I forget one? And of course, all the prions, the ever-present Cape petrels, Soft-plumaged petrel, Mottled petrel, shearwaters … there is a lot around. Lucky who gets a sharp photo of a prion. 02nd-03rd February 2015 – We need one day to get through the pack ice north of Cape Adare, which turns out to be fairly unproblematic. Compare it to the 43 days that the Antarctic needed in 1895 to get through to Cape Adare, coming from the north … I know, it is not fair to compare the Antarctic in 1895 and the Ortelius 120 years later. Captain Kristensen had no ice chart, no steel hull and no 3200 kW in his engine room. But it is good to keep those 43 in mind to understand the environment we are in. The weather Gods are in good mood. It is calm and sunny, a real cruise across the Southern Ocean, we are standing on deck, holding a cup of hot chocolate, camera hanging over the shoulder. Life isn’t too bad like this. See how long it will last. Cape Adare is the point where the Ross Sea coast becomes the coast of East Antarctica. A high rocky peninsula sticking out into the Southern Ocean. You will expect that such an obstacle will catch any winds, clouds and drift ice fields in the area, and there is a lot of all of this. Accordingly, you have to be ready for everything when you are getting near Cape Adare. Hope the best, be prepared for the worst, this has always been the way of thinking for polar travellers, at least those who knew something about the environment they were about to visit, and this has not changed until today. How incredible it was for us when even the morning’s gentle breeze calmed down while we were approaching the famous headland – under a brilliantly blue sky. None of those few whom I know and who have been there will ever believe that. Just a dense belt of drift ice between Ortelius and the dark cliffs, so we’ll get the helicopters out. If good old Ross had seen that! The shore of Cape Adare consists of inaccessible steep cliffs, and the actual landing site is a little, flat peninsula on its western side. A triangle of dark gravel, of volcanic origin and piled up to a series of beach ridges by the everlasting surf, with some small, long lagoons between them. The white-blue icebergs and densely packed ice floes, all swimming in darkblue, calm water, are a view of unearthly beauty from the air, from where we could also already see the immense number of penguins crowding most parts of the peninsula. Ridley Beach, as it is called, is home to one of Antarctica’s largest colonies of Adélie penguins, if not the largest one. 250,000 breeding pairs are mentioned in the literature, good for well beyond half a million individuals. Considering this, we are soon finding surprisingly large areas with few or no nests at all, maybe there is too much snow there in the beginning of the breeding season. On the other hand, many o f the Adélies are climbing up high onto the adjacent cliffs, reaching up to 300 m with their nesting sites. First class views, but the weather protection leaves a bit to be desired, and I don’t even want to imagine the struggle they have to go through to provide their chicks with every single meal. 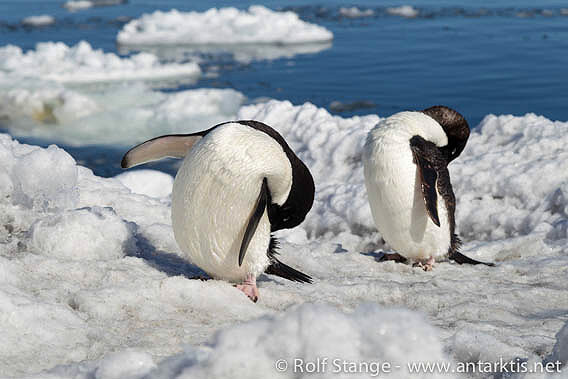 People develope weird habits when there are too many of them in little space, and so do penguins. In 1911, when of Scott’s biologists spend a while at Cape Adare, making some remarkable observations. His paper about the „sexual habits of the Adélie penguin“ was deemed too bizarre for publication. It has been dug out again a century later, believed to be accurate and published only in 2012 in Polar Record. An interesting read. Not only wildlife is teeming at Cape Adare, people have also lived here once for a year. This was Carsten Borchgrevink’s wintering in 1899, crowded together with 10 men in a far too small hut with far too little to keep them busy, leaving far too much time to make life hell for each other. But they were the first ones ever who wintered on the continent of Antarctica. The hut is still there, it is the very oldest one in Antarctica, an icon of polar history, and the only building on this planet that can claim to be the very first one on its continent ever. Hundred thousands of penguins and other assorted wildlife, antarctic scenery on the highest level, the oldest hut of the continent – it is safe to assume spirits were high as we returned back to the ship after a long afternoon out there. The welcome greeting by our great hotel team is icecream and hot wine on the top deck to celebrate the day. Ice in your hand, ice around the ship, ice everywhere shining under a still bright evening sun. It is our last day near the antarctic coast. Once again, Antarctica has shown us how beautiful she can be, and pulled on all strings to do so.